"This is a great appetizer for any BBQ or grilled meal. I always make them camping. I looked through many recipes, and finally decided on this. I love the sweetness of the pineapple and the slight smoky flavor of the gouda. You can also dice jalapeno to add to the cheese mix. " Cut a slice off the stem end of each pepper, and use a sharp paring knife or pepper corer to scoop out the veins and seeds from the peppers (wear rubber gloves and avoid touching your eyes or nose). Mix together the cream cheese, Gouda cheese, bacon bits, pineapple, and about 1 teaspoon of reserved pineapple juice, or as needed to make a workable filling, in a bowl until thoroughly blended. Using a small spoon, stuff the hollow peppers with the cheese mixture. Place a rack or several disposable foil bread pans upside down onto a baking sheet. (See notes for how to make a pepper rack from a foil pan.) Stand the peppers, stem sides up, into the rack, and bake in the preheated oven until the peppers are softened and the filling is hot and bubbly, 30 to 45 minutes. Your go-to cheesy, spicy, zesty appetizer for Game Night, potluck or party time! 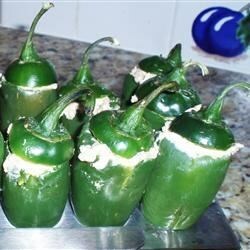 Adjust the number of jalapenos depending on their size. This recipe will stuff 12 large or 24 small peppers. To hold the peppers upright, I use a foil bread pan and cut X's in the bottom, place upside down, and press the jalapenos into each hole. I can usually get 6 to 8 in each. It makes cleanup easy. Just throw them away after cooking. I also have a jalapeno rack I got at a store, but the foil is way easier and will accommodate various sized jalapenos.